To spark discussion, the Walker invites local artists and critics to write overnight reviews of our performances. The ongoing Re:View series shares a diverse array of independent voices and opinions; it doesn’t reflect the views or opinions of the Walker or its curators. Today, musician and Making Music host James Everest shares his perspective on Friday night’s concert by Craig Taborn. Agree or disagree? Feel free to share your thoughts in comments! Great performances can capture an audience, delivering us into the realm of pure presence – where an artist’s careful attention to their craft brings us deeply into their world – their choices and intention, moment to moment – where the sustained intensity of their artistry burns so bright that it can bring together and transport an entire hall full of people into a different place. Minnesota native Craig Taborn’s concert in the Walker’s McGuire Theater on Friday night was titled “Heroic Frenzies,” referencing his myriad influences and his considerable performative versatility, qualities fully displayed on this great 3-part bill, which did just that – brought an entire room together, and ultimately, to its feet. The packed house got a concert perfect for the McGuire space – primarily acoustic instruments, amplified just enough to fill the space, leaving ample room for the entire theater to reverberate with the sounds and spaces created on stage. 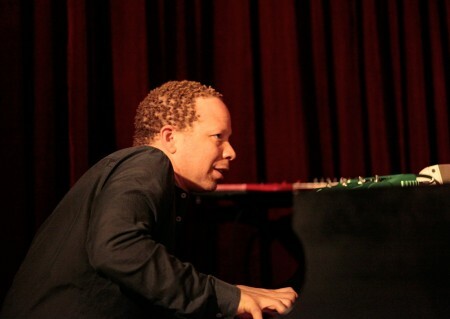 From the moment he stepped from the wings, Taborn commanded our attention – taking a brief bow, then quickly taking his seat at the grand piano, back to the house, pausing for a short breath before easing into the first of three solo pieces which opened the evening. The house was silent and attentive, and Taborn quietly set the tone with a mesmerizing, meditative opening section built upon a delicately repeated left hand figure that he deftly coaxed into subtle variations. Taborn’s penchant for blending classical and jazz sensibilities was immediately clear as melodies and rhythms would straighten then swing, with a constantly shifting harmonic arc. Alternately stately and playful, with growing intensity, his first song shifted into a B section of cascading right hand runs, then slid back to the first section seamlessly. When he ended this first piece, there was a pause, as he sat still at the piano, and the audience sat quietly, transfixed, not sure if it was over, waiting for whatever next note would come, and just as one person began to clap. Taborn began the second piece, a bluesy stomp that exhibited his hyper dexterous technique, crossing hands effortlessly, with the sharpest sense of groove and swing, head nodding. When that second piece ended, there was less doubt, and the audience seized the chance to respond, bursting with applause and cheers. Still intent and focused, Taborn dove right into the third solo piece, after which, he spun on his bench and accepted the thunderous cheers from the crowd, looking to the wings for his bandmates in Junk Magic to take the stage, triggering a spoken word sample that played as they took their places. Dave King (drums) and Erik Fratzke (electric bass) are based in the Twin Cities and have played together for many years, most notably in legendary jazz group Happy Apple, and King grew up with Taborn in Golden Valley before Taborn left for college in Michigan. (They recently teamed with fellow GV native Reid Anderson from The Bad Plus to form an “Instrumental Pop” group Golden Valley Is Now.) Junk Magic combines Taborn with King and Fratzke, plus NYC based Chris Speed on tenor sax and Matt Maneri on viola to play Taborn’s fusionist electro groove compositions. For this wide palette, all players but Speed electronically altered their instruments: Fratzke and Maneri each ran their strings through chains of effects pedals, King added electronic sampling drum triggers and pads, and Taborn played 3 different electric keyboard /synths, in addition to a collection of effects and sampler modules. The opening spoken poem sample gave the group a chance to add color and texture underneath, creeping in with layered ambience, easing our ears into this wider sonic spectrum from the solitary world of the grand piano. As the first tune began to take shape and the spoken sample ended, the viola and sax began making long, snaking lines together, often swerving into microtonal harmony, as King, Fratzke, and Taborn began to coax a groove into place, one accent at a time. The Junk Magic set had an exuberant intensity that no doubt came partly from the fact that Junk Magic hadn’t played together in 3 years. They were all stepping out and listening carefully, an ensemble of 5 individuals who clearly loved the opportunity to create something brand new on stage, with much room to stretch out and improvise within the structures of Taborn’s songs. There was a palpable sense of anticipation as each song spontaneously came to life and each player added their voice, carefully layering harmonies and accents with an immediate, visceral joy. In particular, the viola and sax often played with each other or directly off each other, a unique tonal hybrid – the breath and the bow – to deliver many of the melodies. Urgent distortion on the viola, a slide on the electric bass, laid on Fratzke’s lap, the original Fisher Price Happy Apple joining the parade of King’s percussion toys – all provided textures, while Taborn carefully provided a glue with chords and tones from his affected keyboards. But because of the intense focus of each player, each fresh moment of each song unfolded with the thrill of a collective discovery – new territory for players and audience alike – and continued to build the larger energy and focus in the room. The final section of the night commenced after intermission when Craig Taborn’s Trio took the stage – Gerald Cleaver on drums, Thomas Morgan on upright bass, and Taborn back on the grand piano. In contrast to Junk Magic, the Trio has been playing much more together, and more recently, as they’ve just released a new CD Chants, and it showed in their playing. The music stands from the Junk Magic set were gone. The trio wasn’t reading any charts. Where Junk Magic felt like 5 individuals playing together, the trio felt like a single entity, symbiotically connected to their songs and each other on a highly intuitive, intimate level. Their set began with long pauses, dramatic waiting, suspense and suspended moments that made their connections clear when they would resolve them so masterfully – shifting emphasis from one player to the next, a single voice from three instruments. It was clear in the space they gave each other, in the easy shifts between styles – heavy groove to Ellington-esque majesty – that they had total command of their material and their ensemble expression. One particular highlight came when Taborn ended a solo piano section with a chord that he held extra long with the piano’s sustain pedal – and as the chord slowly faded away, ringing throughout the theater, we were all following its slow arc when Morgan entered with a gentle, brief bass note, allowing us to hear the last strains of the piano, then adding a few more plucks, and slowly building his own bass sequence, which, at its apex was joined suddenly yet assuredly by Cleaver’s light funky rim and high hat pattern, sending the groove into orbit for Taborn to jump back in. So much space given, and yet so tight together! You could feel the hometown pride in the audience grow as the evening progressed, culminating in the standing ovation that brought them out for a sweet, short encore. Through three diverse sets of music, Taborn and his cohorts held our attention and brought us to new places we were thrilled to have been.